J.C. Ellsworth Logging Co. Naselle, WA. Date unknown. 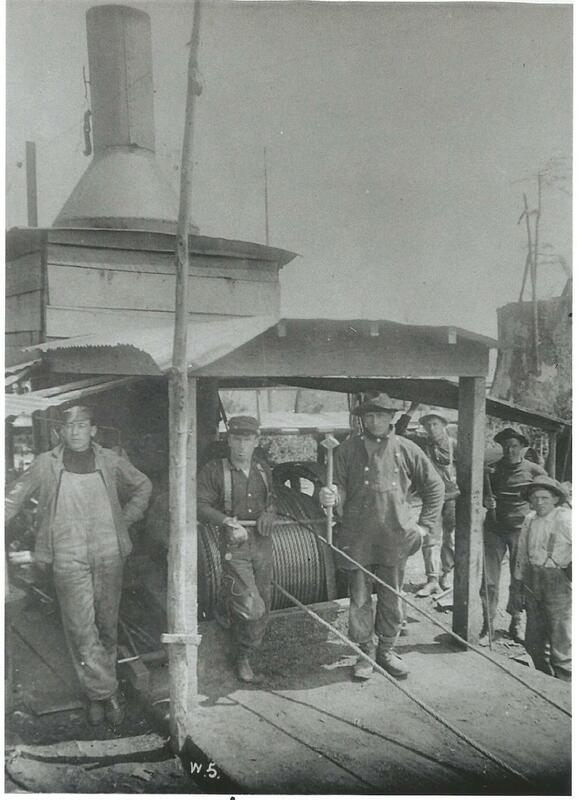 Photo courtesy of Appelo Archives Center, Naselle, WA. Ellsworth Logging Camp. Naselle WA. Date unknown, possibly taken at the U.S. Army Spruce Production Division Camp at Ellsworth Slough during WW1. Photo courtesy of Appelo Archives Center, Naselle, WA. Brix loggers in Ellsworth during the 1940’s. Left to right: Johnny Bighill, Art Paavola, and Arvin Simukka. 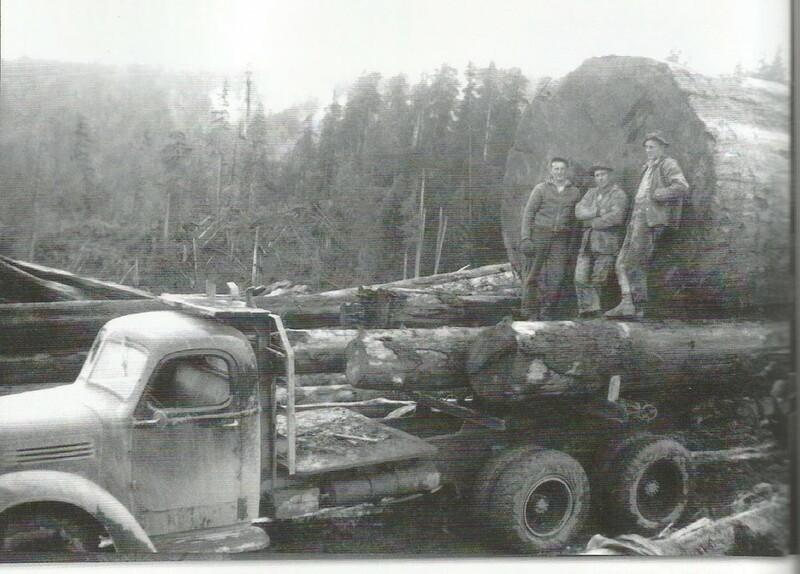 Photo from “When Logging Was Logging: 100 Years of Big Timber in Southwest Washington” 2011. Appelo Archives Center. Before: view of Ellsworth Creek Bridge looking downstream. Before: Ellsworth Creek Bridge looking downstream. Before: Ellsworth Creek Bridge looking upstream. The last time a pick-up truck was able cross the bridge. The top layer of rock had already been removed and re-used to upgrade other roads in Ellsworth. Trimble enabled excavators allowed Ohrberg Excavation operators to efficiently and accurately restore slopes to engineered specifications. Two excavators working on decommissioning the northern road approach to the bridge. In conjunction with seasonal and weather related timing restrictions, a coffer dam was installed to mitigate potential impacts to Ellsworth Creek. Two excavators, a bulldozer, and an off-road haul truck (not pictured) were used to do the work. After uncovering several feet of earth, the bridge decking is revealed. After almost 80 years underground the cedar wood in the decking was remarkably sound. After the bridge was deconstructed, the timbers were used to create log jams and foster stream structure. After. Log jams completed and slopes restored. After. Ellsworth Creek looking upstream at the former bridge site. In the early 1940’s a cedar tree standing in the Ellsworth Creek watershed and measuring approximately 6 feet in diameter was felled by loggers from the Brix Logging Company. The bottom 110 feet of that tree was bucked into two 55 foot lengths and laid parallel on either side of Ellsworth Creek. Those two pieces formed the foundation for a bridge that spanned the creek until July 2016 when The Nature Conservancy, with the help of Ohrberg Excavation, removed that bridge, used the timbers to enhance stream structure, and restored the stream banks in an effort to improve our freshwater ecosystems and salmon habitat. It was with mixed feelings that I watched this bridge retire from service. The design and materials were simple, efficient, and obviously effective. It was a tribute to ingenuity. Removing this bridge was necessary for many reasons; the environmental benefits are undeniable and, after over seven decades, its utility and integrity were eroding. Retiring this bridge from service supporting logging helps us to once again recruit Ellsworth Creek into service supporting salmon. But its history, and remembrance, are important. Not only was the bridge used to haul logs and loggers for almost 80 years, it was a remnant and a reminder of the history of the Pacific Northwest, of the men and women who resolutely toiled under arduous circumstances to help build this country. For better and for worse, these people worked the land and shaped it into what it is today. While some may debate about the logging history of the Pacific Northwest and the legacy that it left, I cannot dismiss the value of people who worked so hard under perilous conditions to achieve such monumental feats. That same spirit and innovation, combined with modern machinery and technology, was apparent as the Ohrberg crew expertly removed the bridge, rebuilt the natural historic gradients, and decommissioned the road approaches as we unmade the human history and remade the natural history of Ellsworth Creek. The large diameter cedar that was used to make the bridge was returned to Ellsworth Creek in the form of a new log jam designed to foster salmon habitat. Given historic logging practices and “stream cleaning” activities from years past, it is unusual to be able to contribute wood of this size and type back into the system. When the work was completed my feelings were no longer mixed. Working with the crew, I experienced the same stalwart work ethic of those who built the bridge long ago; and I felt the absolute joy of seeing the namesake creek of this preserve take another positive step in our restoration goals. At Ellsworth Creek Preserve we are striving to maintain and restore the forests and waters, we are striving to stay true to the natural history of the Willapa Hills. So that when salmon at sea answer the primordial call and resolutely undertake their own monumental feat of returning home to spawn, the home they return to looks like that of their ancestors who answered the same call long before there were roads and bridges in the neighborhood. David Ryan, our field forester, reflects on his time at Ellsworth Creek watching Chum salmon return upstream. From Hawaii to Southwest Washington: sharing lessons in land management, conservation and economics.